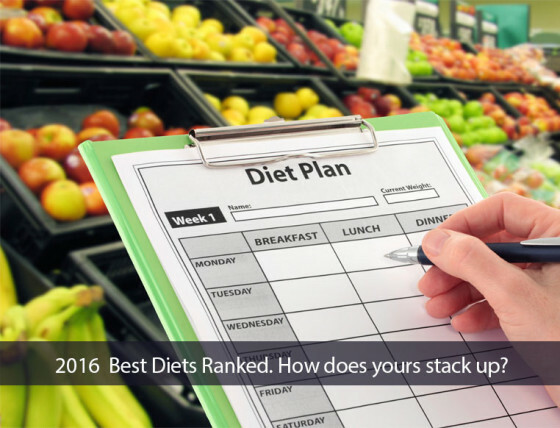 2016 Best Diets Ranked. How does yours stack up? Featuring rankings and information on 38 diets and eating plans for the estimated 45 million Americans who will diet this year, the U.S. News and World Report Best Diets of 2016 guide puts diets and eating plans to the test. An estimated 45 million Americans will begin a diet this year in the hopes of achieving a healthier, happier lifestyle. Confronting these dieters are a nearly overwhelming array of dieting options, methods, fads and superstitions. Knowing which diet is the most effective and most likely to suit your daily routine is an invaluable first step on the road to a healthier life. Be it Paleo, Dukan or Raw Food there are nearly as many diets as there are dieters. To make this often vexing choice easier, U.S. News and World Report has released their guide to the best diets of 2016. The guide was developed by a panel of health experts that included nutritionists and clinical specialists in diabetes, weight loss and heart health. Included among them was Dr. Lawrence Appel, Director of the Welch Center for Prevention, Epidemiology and Clinical Research at Johns Hopkins University and a lead on the clinical study which lead to Innergy®, a telephonic coach-based weight management program based on Johns Hopkins research. A total of 38 diets were ranked, providing a thorough overview of a wide range of diets and eating plans. The complete list is available online, allowing potential dieters to browse various programs and select those which best meet their needs.